I have to admit that I haven’t read this one yet. And while I’m interested, I have to admit that since it’s too late for parenting my son (he’s applying to grad school), I wonder if it would just add to my guilt. 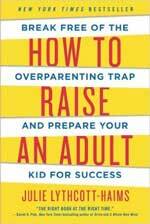 But those with a few years of parenting left, this might be a good read.